This workshop was put on by MALLA (Malcolm and Ardoch Lakes Landowners Association) and their Lake Stewardship Committee. Speakers were Kelly Styles from Mississippi Valley Conservation Authority and Brook Schryer from Ontario Federation of Anglers and Hunters with sponsorship from Federation of Ontario Cottage Associations. Brook spoke at length on a number of species which are invasive, not all of which have reached our area. The biggest concern in our area is Spiny Water Flea and Zebra mussels which is what the MVCA monitors in the lakes in our area. Rusty Crayfish is also coming into the area. As far as plants are concerned Eurasian Water Milfoil, Eurasian Reed Grass (Phragmites) seem to be the biggest concern although the Ottawa and Rideau waterways also have European Water Chestnut. 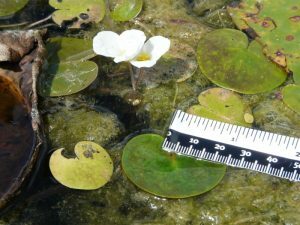 While there are a number of non-native species in the area, not all of them are considered invasive. For a species to be invasive, it has to be able to adapt to different conditions, reproduce quickly and efficiently and displace native species, disrupting the food chain. The bad news about aquatic invasive species is that once they have spread, there is very little you can do to eradicate them. 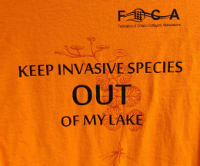 The focus on containing invasive species to prevent their spread. 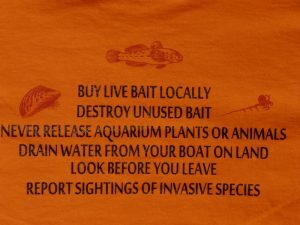 The spread of species is almost all from boaters, moving boats from one lake to another, and anglers, bringing in non-local bait and water and dumping it in the lake where they are fishing. Stringent new regulations on bait came into effect in Ontario in November 2016. 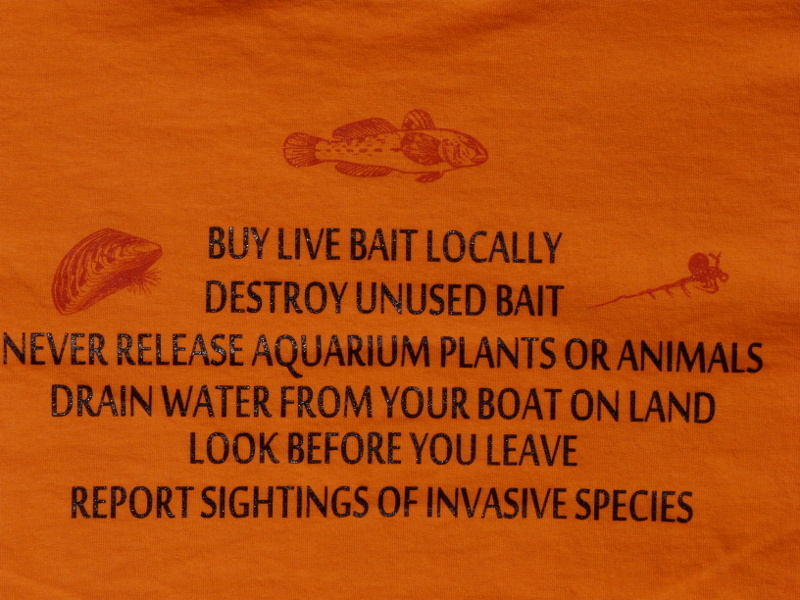 These regulation have to deal with live bait and the movement of live bait. It is also illegal to dump a bait bucket in the water. To dispose of live bait, it must be dumped out on the land, 30 m from the shore. While clean and drain regulations are not in effect yet in Ontario, they are in effect in some Canadian provinces and in New York state. Before moving boats between lakes, boaters should make sure that all plant material in removed from the boat and trailer. Even more importantly, the boat must be drained so that no water is transferred between lakes. Ideally, the boat should be left to dry for 2 (hot, sunny) days to 7 (cool, overcast) days before being transferred to a new waterway. A 6 inch piece for Eurasian water milfoil can irreversibly invade a lake. Although most of the lakes in the area already have Eurasian water milfoil, I have not found it in Patterson Lake. 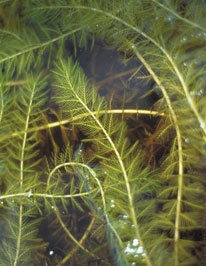 We have Northern Water Milfoil which looks almost the same except there are only 5 – 10 leaflets on each leaf. 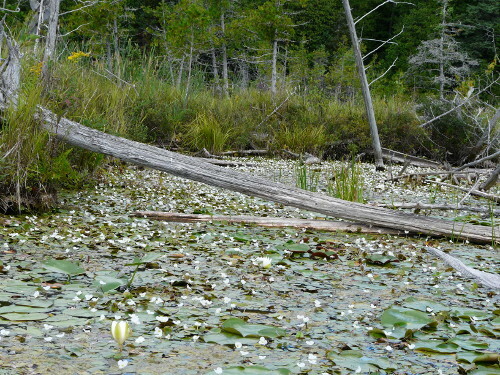 For more information on Eurasian Water Milfoil, you can visit http://www.invadingspecies.com/eurasian-water-milfoil/. It is particularly important in make sure that no water transfers between lakes. Some of the invertebrates invade lakes in stages that are small enough that they are not visible without magnification. You may have them in your boat, in your motor or bait bucket without being able to see them at all, even if you are looking. For example, the zebra mussel is transferred in its microscopic, just hatched, veliger stage. This is a free floating, almost transparent stage where the zebra mussel is invisible to the naked eye, able to feed on algae and grow big enough to attach and grow a shell. In Patterson Lake, the last time plankton sampling was done, neither the Spiny Water Flea nor Zebra Mussels were found in the lake. Hopefully, we will send in a plankton sample this year. I have found Frog Bit and Purple Loosestrife at the Lake. There appears to be invasive Phragmites along the 417 and along the turn onto March Road. Also, there seems to be a stand starting just before Sugar Bush Way on Concession 3 Dalhousie from Watson’s Corners. For further information on Phragmites, you can visit the Ontario invading species website at http://www.invadingspecies.com/invasive-phragmites/#. Although there is a lot of concern about Wild Parsnip, the workshop was only concerned with aquatic invasive species and it was not mentioned. We can all do our part by making sure that we are not a transferring water or plant material into our lake.